Too hard! Or just perfect? Bite a hard candy and you know, but can you measure it? This example shows how an expert sensory test (which can be variable between individuals and from day to day) can be quantified and reused in objective mechanized testing. There is more to a perfect candy than just hardness—the way it breaks matters as well. This too can be measured. Various fixtures can be used on a food texture analyzer, including bite simulators, but for this test a 6 mm diameter cylinder probe was used. A Food Technology Corporation (FTC) TMS-Pro texture analyzer was fitted with a 500 N intelligent loadcell, and programmed to test a series of samples from the same bag of candy. The test program moved the probe at 50 mm/min to meet the sample, then move a further 2 mm to break it, before returning to the start position. 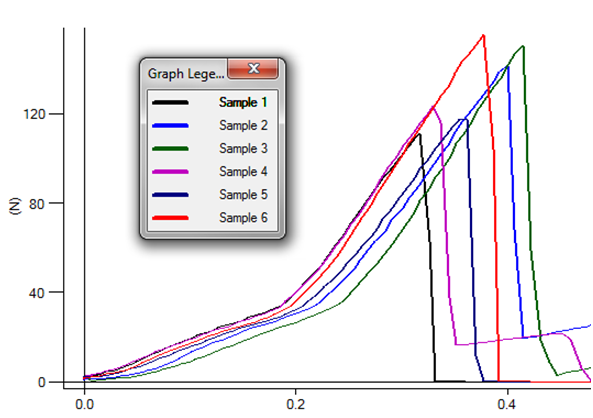 The TL-Pro software then analyzed the data, and calculated the peak force achieved in breaking each sample. The pattern of break could also be assessed visually. Consumers may agree that larger pieces are better than crumbs, but are they consistent? Different fixtures could be compared for representation of a real bite. 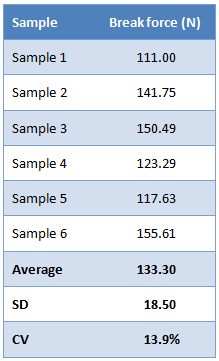 The graphical representation from TL-Pro, of the test results for the eight samples, is shown here (force applied, against cumulative displacement). We can see some variability between the samples, both in displacement required to break, and the peak force achieved. Two gradients emerge, which on a production line may be worth investigating if they become too distinct. The tails of the traces show some secondary resistance from fragments which can be ignored as too random. 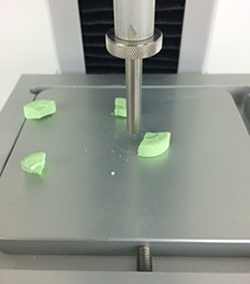 This example provides an objective and repeatable method for measuring the break force of hard candies as an accurate proxy for the bite experience. 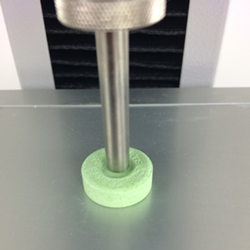 By comparison with a batch of samples subjectively tested as acceptable, an average break force measurement can be used for routine testing, with a tolerance band built in, to present instant pass-fail indication. On the production line this can give rapid feedback to correct drift in a process, and in formulation can be used to improve consistency. Different probes could be compared for suitability with a particular product, according to the characteristics of the break, in order to provide the clearest data profile. Different displacements, once an average break displacement has been measured, could also avoid secondary features arising from broken fragments. Using a food texture analyzer therefore provides a detailed and objective picture of what lies beneath the subjective sensory test.